Amyloidosis refers to deposits of a protein (called amyloid) in the tissues. This condition can affect multiple organs. The deposition of amyloid may be a by-product of normal aging. 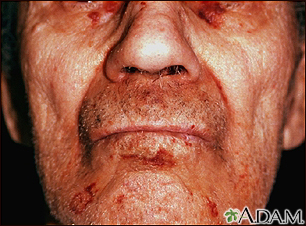 In this picture, we see how amyloidosis can cause a patchy, bruised appearance to the skin. Bruises of the skin around the eyes are referred to as the characteristic pinched purpura.